Chamberlain Companies, Inc. recieved the AWI Award of Excellence and had the project featured on the cover of Design Solutions Magazine for their work at SSMC. 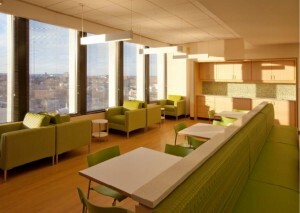 Chamberlain Companies, Inc. recently completed an array of renovations to the Harvard, MIT, and MGH medical research affiliate, including conference rooms of all sizes and a custom tea room for collaboration. 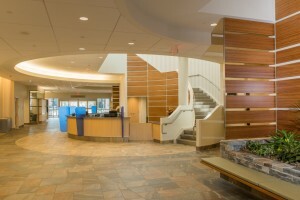 Chamberlain Companies, Inc. constructed reception desks, interior seating, and paneling for the pharmaceutical company, including this custom spiral desk. Chamberlain Companies, Inc. performed multiple renovations and installations at the facility, including this featue wall.